“Traces to Nowhere” is the opening episode of the TV series Twin Peaks (1990-91) following the two-hour series pilot. It continues with the investigation of a precipitating event that took place prior to the events described in this series – the murder of a highschool girl in the fictional town of Twin Peaks, Washington (state). This episode was directed by Duwayne Dunham, and it was scripted by series co-creators David Lynch and Mark Frost, who also scripted the series pilot and the subsequent Episode 2 ("Zen, or the Skill to Catch a Killer”). In the pilot it was revealed that the local highschool homecoming queen Laura Palmer (Sheryl Lee), was brutally raped and murdered, and her battered corpse had been found wrapped in plastic on the banks of a local river. FBI agent Dale Cooper (Kyle MacLachlan) was called in to supervise a local investigation led by Sheriff Harry S. Truman (Michael Ontkean), and much of the series pilot is spent introducing the local characters of Twin Peaks who will figure in the story. This “Traces to Nowhere” episode doesn’t really have a self-contained narrative, and its time is primarily spent “thickening” the plot by introducing more obfuscating evidence and expanding on the contexts of some principal characters. The viewer does learn a few things of interest. Agent Cooper and Sheriff Truman had arrested Laura Palmer’s boyfriend, Bobby Briggs (Dana Ashbrook), and her secret lover, James Hurley (James Marshall), both of whom we know separately saw Laura on the night of the murder. But Cooper now becomes convinced that both are innocent of the murder, and he has them released. Now evidence is uncovered, though, (sometimes only to a few) that points in other directions. An abusive trucker, Leo Johnson (Eric Da Re) rudely orders his wife Shelly (Mädchen Amick) to wash his clothes. When she discovers his shirt has bloodstains on it, she hides the shirt away from him, and the shirt’s disappearance causes Leo to give his wife a brutal beating. We also learn that Leo is embroiled in some presumably criminal operation with Bobby Briggs and his friend Mike Nelson that involves a missing $10,000 that Briggs and Nelson now owe Leo. Also ,James Hurly’s uncle, gas station owner Ed Hurly, claims he was given a knockout drug by bartender Jacques Renault at the local bar, The Roadhouse. In addition, the viewer gets glimpses of two additional mysterious characters. One is a strange one-armed man who wanders into the police station and disappears into the morgue. 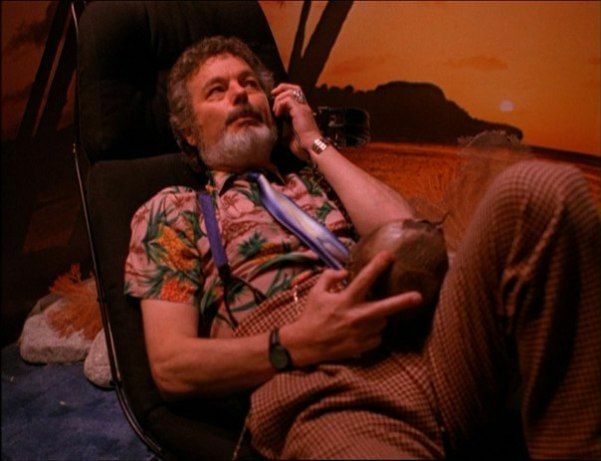 And Laura Palmer’s mother, Sarah Palmer (Grace Zabriskie) has a hysteria-inducing vision of a mysterious, sinister man hiding behind her bed. But apart from this specific information concerning the murder investigation, the episode spends a fair amount of time providing more background on four beautiful women in the narrative. Since the murdered girl, Laura Palmer, was a beauty queen, one might suspect that these four women are also at risk. All four of these women are magnetically attractive, and the viewer is drawn into following their fates as the series progresses. In fact one could say that these four women are, along with Agent Cooper and Sheriff Truman, the major protagonists of the series. Shelly Johnson is an innocent young girl and works as a waitress at a local diner. She is married to the abusive Leo Johnson, who I have already mentioned is a murder suspect. Jocelyn Packard (Joan Chen), a beautiful young Chinese woman, is the widow of the recently deceased Andrew Packard, who owned the local sawmill in the town. She now legally owns the sawmill, but the land on which it is situated is greedily coveted by wealthy and corrupt local landlord Benjamin Horne (Richard Beymer). He is scheming with his paramour, Catherine Martell (Piper Laurie), who is the sister of Andrew Packard, to arrange a hostile takeover of the property. Jocelyn, we already know, is having a semi-secret romantic relationship with Sheriff Truman. 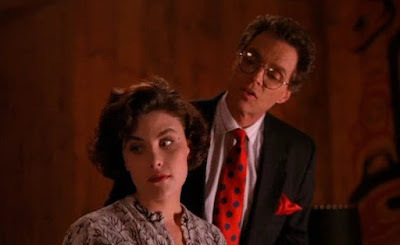 Audrey Horne (Sherilyn Fenn) is the comely daughter of unscrupulous businessman Benjamin Horne. She uses her feminine wiles to assert her independence and defy her father’s ways. 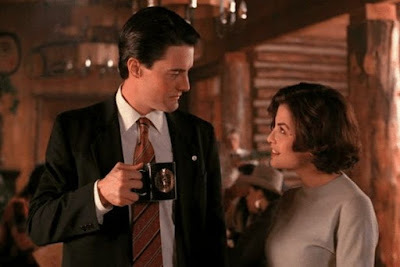 In this episode she seductively approaches Agent Cooper for some small talk, suggesting that she is attracted to this handsome newcomer in town. Donna Hayward (Lara Flynn Boyle), who was Laura Palmer’s best friend, teams up with Laura’s secret lover, biker James Hurly, to try and solve the murder mystery. Soon, however, they find themselves falling in love with each other. Despite these separately fascinating threads concerning the four women, though, this episode has some weaknesses due to the dramatically over-the-top presentations of some of the other characters. Bobby Briggs and Mike Nelson are unbearably obnoxious and behave like rabid jackals foaming at the mouth. Benjamin Horne and his lover Catherine Martell are ludicrously avaricious. The grieving mother, Sarah Palmer, is almost continuously in a hysterical state. Ed Hurley’s wife, Nadine (Wendy Robie), is so persistently and outrageously eccentric that she defies believability. The Log Lady (Catherine E. Coulson), who asserts that the log she always carries around has magical properties, is another character who seems to have no other purpose than to project further eccentricity. Nevertheless, this episode does provide fuel for further developments.